for $8,192 f.o.b. Oshawa, Ontario. It weighed in 1,740 kilos (3,836 pounds). As a concession to environmental concerns, the Oldsmobile Division of General Motors had shrunk its full-sized passenger car lines in 1977. The Ninety-Eight, the Delta 88, the Toronado and the Custom Cruiser station wagon all went under the knife. The newest incarnations from one of the auto industry’s pioneer marques got a much needed makeover that took advantage of weight and space efficiency achieved by the latest in engineering techniques and radical design concepts The Canadian public liked the new luxury packages and the sleek, slim elegance presented. They rewarded Oldsmobile with an appreciable increase in sales. The models were returned for their second season on the market with minimal sheet metal changes. 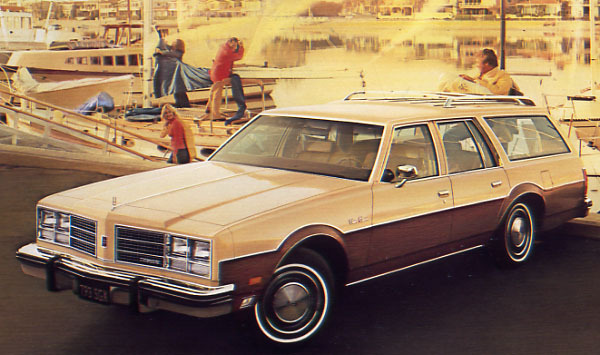 Surprisingly no Oldsmobiles of any kind were built by GM Canada in 1978; all were imported from the US. Regardless of its point of origin, the GM Division compared itself to the genius of the visionary Leonardo da Vinci in reinventing itself and showing off its new excellence in automobile design. Faux wood was used heavily on the 1978 Oldsmobile Ninety-Eight instrument panel. For another $646 one could add GM’s Four-Seasons air conditioning. The big news at Oldsmobile this season was under the hood. In keeping with its long-standing tradition of being GM’s experimental division, Oldsmobile introduced the world’s first V-8 diesel engine for passenger cars. Advertising bragged, “It saves like a diesel…runs like a V-8…because it’s both.” To promote confidence among would-be consumers and boost sales, a complete directory of gas stations selling diesel fuel throughout Canada and the United States was compiled and placed in the glove box. The 5.7-litre diesel promised to be as smooth and quiet as any gasoline powered vehicles and save plenty of money at the fuel pumps. For $6,861 one could purchase a 1978 Oldsmobile Delta 88 Royale Coupe. The diesel engine option cost an additional $996. Traditional engines were still the norm. The Delta 88 made use of the 3.8-litre V-6 mill, though the 4.3-litre V-8 was optional. The 5.7-litre V-8 was standard in the Custom Cruiser and the Ninety-Eights. Toronado was blessed with a 6.6-litre V-8 and that mighty muscle was an extra-cost choice for all of the other full-sized Oldsmobiles. To avoid lawsuits, Oldsmobile issued a disclaimer that the engines used in its cars could have been sourced from other GM divisions. Moored next to the Ninety-Eights on the Oldsmobile dock were the Delta 88s. The more posh version was set apart by its Royale insignia and distinctive trim. It pledged to be a new benchmark of function because it was the leading edge of full-size car design. All of the traditional big car elegance of Oldsmobile could now be had at the cost of lesser vehicles. weighed in at 1,835 kilos (4,045 pounds). Not forsaking the station wagon market, the Oldsmobile Custom Cruiser boasted a clean, square cargo area wide enough to hold a standard sheet of plywood. Velour seats whispered, “You’ve arrived,” with this marina pleaser. The front centre armrest was standard as was carpeting throughout. A fully automatic ride leveling system was employed for a magnificent ride. Finally, to complete the division’s full-sized offerings, the personal luxury Toronado led the Oldsmobile armada. Front-wheel drive was its edge in the marketplace. “The weight of the engine rides over the wheels which power it forward. This helps provide road-gripping traction—as you are pulled along, rather than pushed. And the confidence this generates is a singular pleasure as you ride in the inner world of Toronado.” Leather upholstery, Four-Season air conditioning, automatic transmission, power brakes, power steering and power windows along with an AM/FM stereo were all standard equipment. An XS package added a sunroof and a unique panoramic rear window. 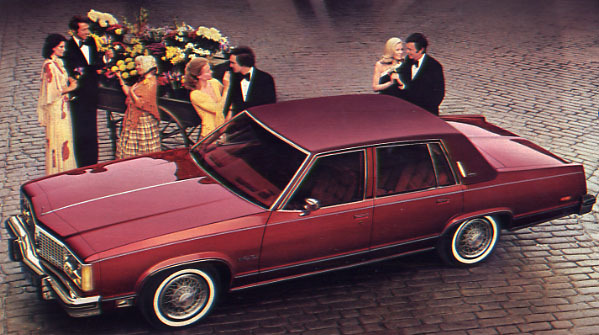 The most expensive Oldsmobile in 1978 was the $10,520 Toronado Brougham. This one features the extra-cost XS package with sunroof and the unique wraparound rear window. Potential owners were invited to add on to their Oldsmobiles to give them that “final personal touch.” A CB radio could be added to the AM/FM stereo setup or one could have the 8-Track Stereo (the ultimate music machine) configuration. Two sunroofs, special wheels and wheel discs, Tempmatic or Four-Season air conditioning, reclining front seats, Tilt-and Telescope steering wheel or the Tilt-away wheel, a lighted vanity mirror, a Rallye instrument cluster, cruise control, a fuel economy meter, a pulse-wipe windshield wiper speed setter., cornering lamps, a three-way dome reading lamp, a door handle “nite lite” that lit up the interior and the keyhole, a stowaway spare tire, an automatic leveling system, a choice of light or sound monitoring systems. There were power door locks, power windows, and six-way power seats and a power trunk lid release. If the owner wasn’t yet tired of checking off little boxes on the order sheet, there was the limited-spin axle assembly, a variety of performance-ratio rear axles, trailering equipment, suspension packages, tinted glass, a trip odometer, a remote control mirror with an outside thermometer, convenience light packages, a digital clock, body side mouldings, vinyl roof and much more. Exterior colours for the fill-sized Oldsmobiles were Silver Metallic, Light Blue Metallic, Carmine Red Metallic, Light Camel Metallic, Medium Camel Metallic, Dark Camel Metallic, Russet Metallic, Light Green Metallic, White and Black. Paint stripes could be had in nine colours, and special, extra-cost two-tone paint treatments applied Silver, Light Blue, Light Green, Camel Beige or Dark Carmine to the lower body half. 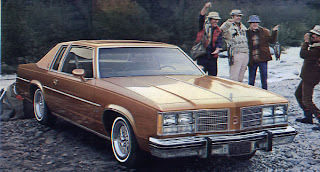 The Delta 88 turned out to be the best selling Olds for GM Canada for 1979. Calendar year sales were 18,754 units delivered. The Oldsmobile Ninety-Eight and Toronado figures were lumped together and they accounted for 8,456 more sales. It was the seventh year in a row for GM Canada to shatter records; the giant from Oshawa claimed 55 percent of all cars sold domestically. Copyright James C. Mays 2006 All rights reserved.